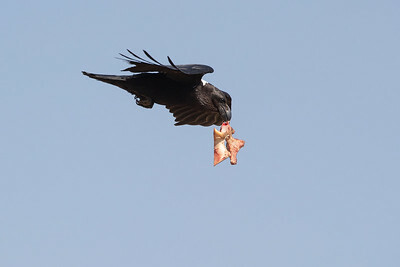 White-necked Raven stealing a bone put out for vultures. 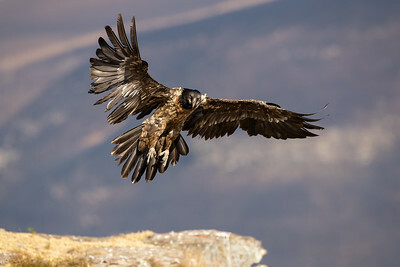 An juvenile (first-year) Lammergeier (Bearded Vulture) landing. 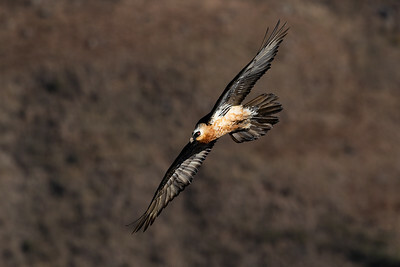 A juvenile (most likely first-year) Lammergeier (Bearded Vulture) flying past our hide. 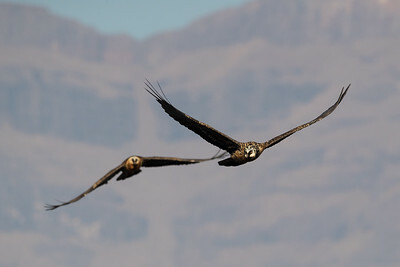 Lammergeiers chasing. 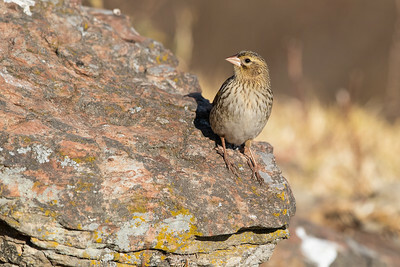 Immature bird (perhaps 2 years of age) chased by older bird (possibly 3-4 years old or so). 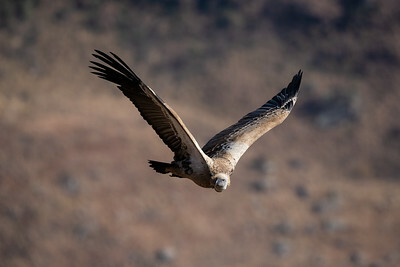 Up close with the vulture! 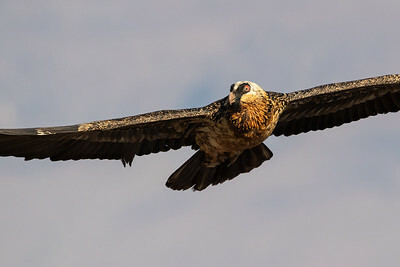 An immature (perhaps 3-4 years old) Lammergeier staring at me. 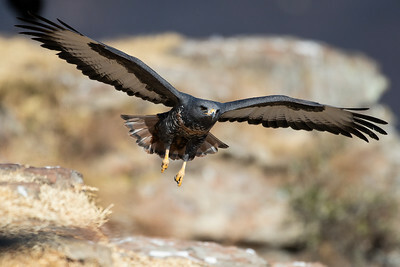 A Lammergeier (about 3-4 years old) flying at me. 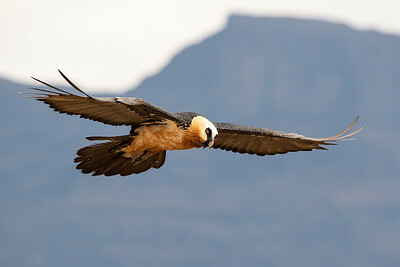 A sub-adult Lammergeier (Bearded Vulture) flying past our hide. 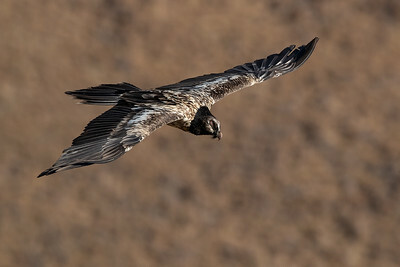 An adult Lammergeier passes our viewpoint. 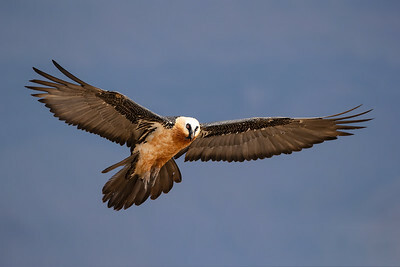 An adult Lammergeier (Bearded Vulture) about to land in front of us! 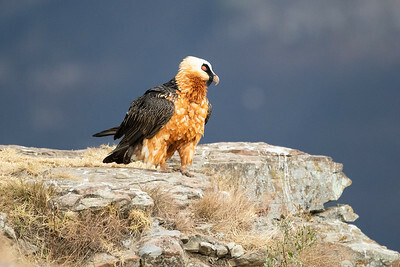 An adult Lammergeier (Bearded Vulture) looks at the valley below. The vulture has landed (almost). 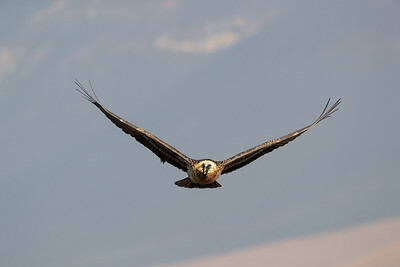 An adult Lammergeier (Bearded Vulture) landing on the ledge out in front. 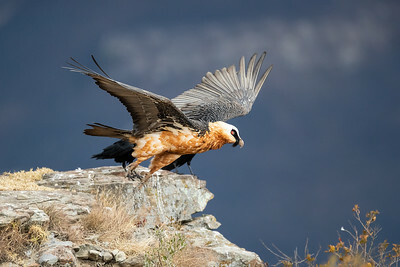 An adult Lammergeier (Bearded Vulture) suveying around itself. 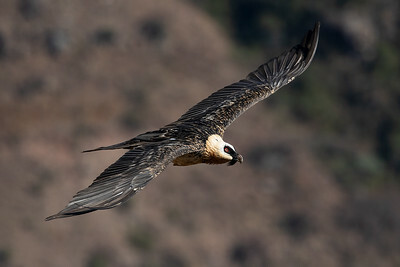 An adult Lammergeier (Bearded Vulture) launches off the clifftop. 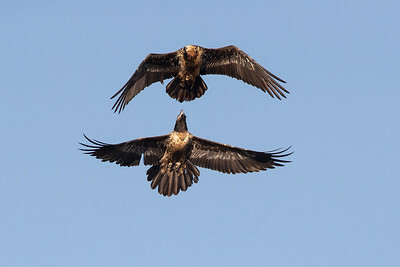 Two immature Lammergeiers (Bearded Vultures) tussle in the air. 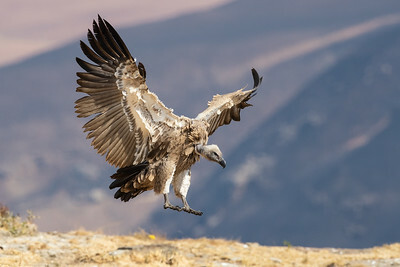 An adult Cape Vulture flying past our hide. 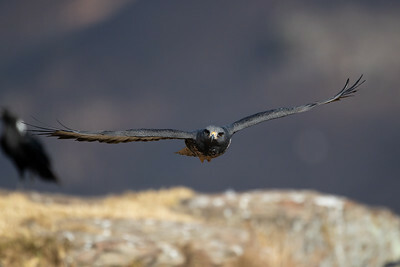 A Jackal Buzzard coming closer. 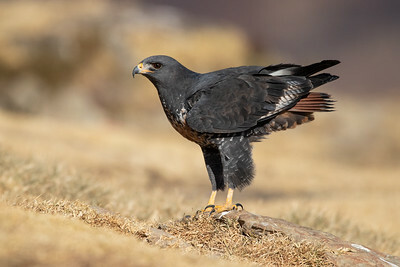 An adult Jackal Buzzard poses before checking out some bones. 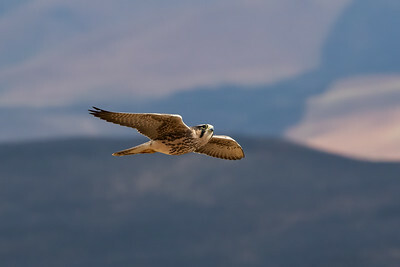 A Lanner Falcon buzzes us (photo by Netra and used with her permission). 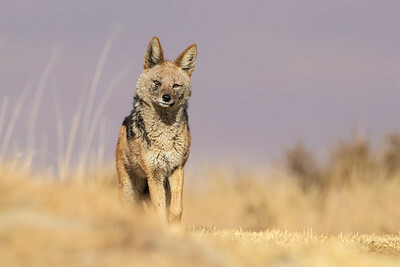 A Black-backed Jackal sussing out the surroundings. 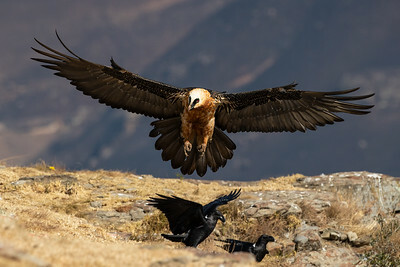 A composite of two images taken seconds apart of the jackal looking for bones while the Lammergeier sits and rests only meters away on the edge. 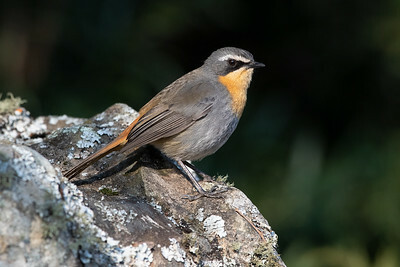 A robin-chat poses for me on the resort grounds. 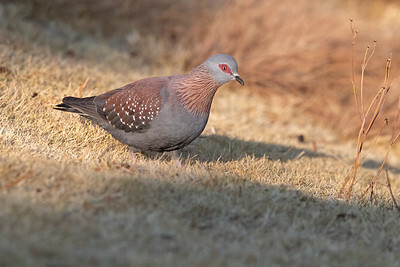 A pigeon seeks out seeds at the hide. 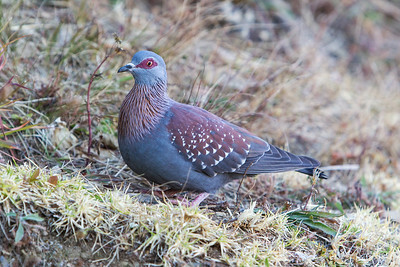 A pigeon feeding outside the hide. 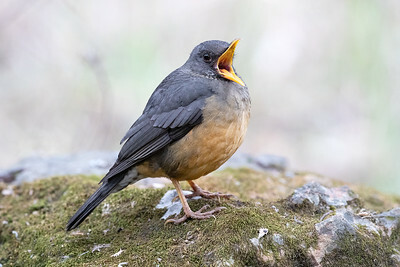 Photographers are boring says the thrush.